Residents and businesses located in Bartholomew County can dispose of their waste at the Bartholomew County Landfill. Loose loads of trash must be tarped or the user will be assessed a surcharge. 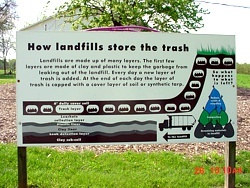 Liquids, PCB's, oil, oil based paints, hazardous wastes, yard waste, tree trimmings, white goods (appliances), closed topped drums, hot burn barrels, electronic waste and whole tires are banned from landfill disposal. $20 fee for TV and Computer Monitors recycling. See Recycle/Reuse (►Here) to dispose of these banned items properly. Fees: Loads < 200 lbs: One load per day free of charge. Loads > 200 lbs: $27.50 per ton.